How would you like to bundle a few of your favorite things together in one holiday experience? Spectacular lights, sleigh rides, Santa visits, holiday music, great food, ice skating, shopping, parades, and fireworks. Festivals of Lights pull together many joys of the season into one well-orchestrated, amplified experience. Though the festivals have their origins in diverse cultural celebrations, they have morphed into extravagant, new celebrations to welcome the holidays. In France, there is the Fetes des Lumieres; in Ontario, there is the Festival of Northern Lights. 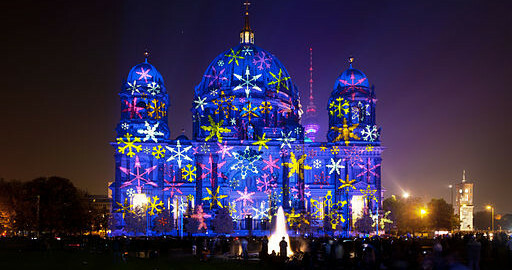 Berlin’s Festival of Lights lasts 12 nights starting in October, and London’s lasts 6 weeks. Now, a growing number of cities in the U.S. have spectacular Festivals of Lights as well. Here are 5 festivals across the U.S. that have particularly spectacular light displays and memorable activities. If you are anywhere near these locations in the next month, be sure to enjoy that city’s unique Festival of Lights—then consider how your township can start its own festival. Festival of Lights in Riverside California was ranked by Good Morning America and People Magazine as one of the best in the U.S. But it’s more than just the lights. There are many activities—ice skating on an outdoor rink under the stars, free nightly music, appearances by Santa and his reindeer. The festival starts with a flip of a switch that illuminates the Mission Inn, downtown buildings, and palm trees—with over 3.5 million lights. Then, a firework show welcomes the start of the holiday season. New York City’s Festival of Lights—though New York City has long been known for its beautiful tree lighting at Rockefeller Center, this year marks the first time that it will join some of the prestigious international cities and have its own Festival of Lights. Special features will be illuminated sculptures, wearable light technologies created by renowned artists, and a laser light show under the tunnel of the Manhattan Bridge. The Holiday Trail of Lights in Louisiana has existed for 30 years and the trail consists of 2 major highways (I-20 and I-49) and spans 8 cities in Northern Louisiana, each with their own set of festivities. Then entire trail tour can be done in 1 day, spending about an hour at each city, but many people like to spread it out and stay overnight at one or two of the cities—a holiday road trip of lights. 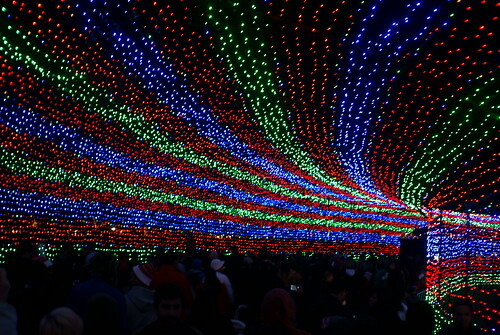 The 50-year-old Holiday Trail of Lights in Texas is on an actual trail at Zilker Park. It sports a Fun Run in the lights, an enormous lighted tree hung from a moon tower, stage performances, an opening party, and the trail itself is illuminated with a plethora of stunning lights arching overhead. Boston’s Festival of Lights is called Blink and incorporates a light and sound extravaganza at Fanueal Hall Marketplace and a special tree illumination. The light show uses over 350,000 LED lights to illuminate Boston’s skyline—with the songs of the Holiday Pops—all in a synchronized, seven-minute spectacle that runs continuously each evening. What if your township is too small to do an extravaganza of fireworks, laser lights and synchronized music? You can still develop a unique Festival of Lights. “Never despise small beginnings” (Chris Guillebeau or Zechariah). Though all of the larger cities had a unique twist on activities, the common foundation was a beautiful light display. The best place for your township to begin developing a Festival of Lights is with quality LED lights. Cost effective, energy saving, and durable, you can save even more and get a great value when you buy commercial Christmas LEDs in bulk quantities—perfect for community-wide displays. Heavy duty gauge wire and coaxial connections prevent the strands from pulling apart, prevent moisture getting in the lines, and discourage tampering—the best foundation for your Festival of Lights, and the best foundation to multiply the magic of Christmas. “ChristmasMarketJena” by ReneS at flickr – http://www.flickr.com/photos/rene-germany/2126809489/?addedcomment=1#comment72157611118374576. Licensed under CC BY-SA 2.0 via Wikimedia Commons.